Breeding your mice is not a decision to make lightly and you absolutely must consider what you will do with any babies that result. Most pet stores have established suppliers already. You should also carefully consider the temperament and health of the mice you are breeding. I do not advocate breeding mice for the average owner, but the information here may be helpful if you find yourself with a pregnant female by accident, or perhaps from the pet store. Mice reach sexual maturity by 4-6 weeks. However, females should not be bred for the first time until they are 8 to 12 weeks old. Female mice come into estrus (heat) every 4-5 days (this is the time they will be fertile and receptive to a male). They will have a fertile estrus within 12-28 hours after giving birth, and within a couple of days of weaning a litter. The gestation period of mice is usually 19-21 days. 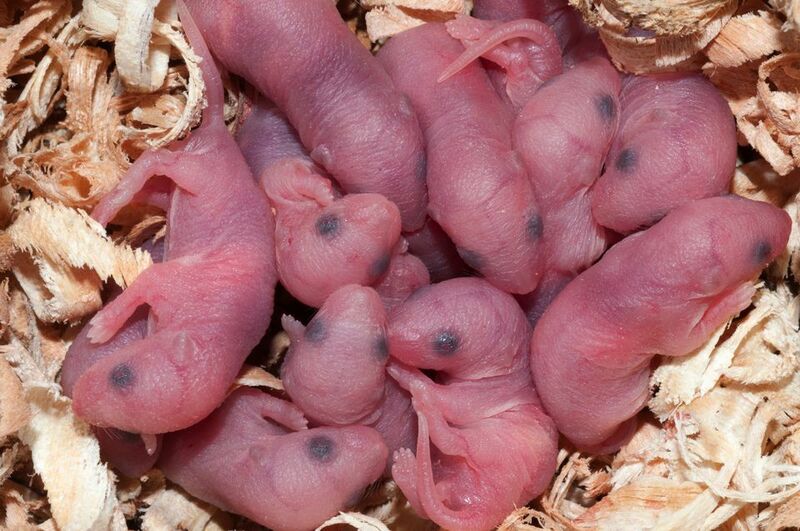 Note: mice can breed shortly after giving birth. If they breed while already nursing a litter, the gestation period can be longer (around 28 days). Litter size is quite variable; 7-12 pups per litter is considered average but more is not unusual (20 in a litter is quite possible). Mice are usually weaned by 21 days but ideally should be kept with mom until 3.5 to 4 weeks of age. Separate the male pups from the female pups by 4 weeks old, though.